Warren Lemky surveys a mountain slope. Highways and bridges are earthy matters and a geotechnical engineer is just the kind of person to delve into the deep subject of what’s below ground. 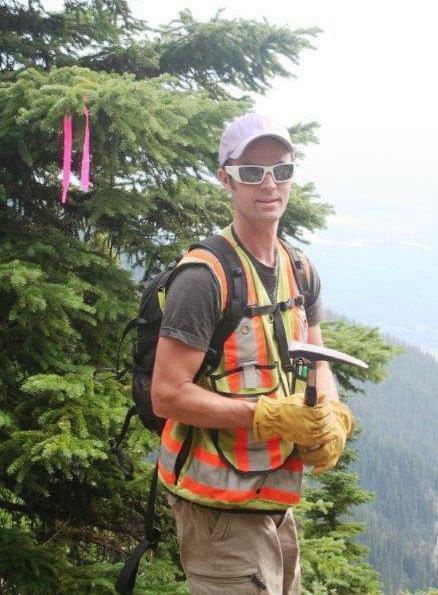 We spoke with a geotechnical engineer, one of our four types of engineers, during National Engineering Month to find out about his work on B.C. highways. Meet Warren Lemky, regional geotechnical design engineer, based out of the Ministry of Transportation and Infrastructure’s Prince George office. Warren, what’s your role as a geotechnical engineer? My responsibility is basically to ensure the foundational integrity of the road system and to make sure the slopes above and below the highways are stable, so the roads are safe to travel. Geotechnical engineering is the study of how soil and rock behave and the design of foundations, slopes and structures built upon them. As a geotech, I look at geological conditions along B.C.’s road network and how they may affect soil behaviour under changing circumstances. I look at how rock and soil respond to different forces like those that occur naturally in the environment, and how they are affected by loads put on them. Typically, there are three main elements at play: ground water conditions, type of soil and/or rock, and the overall terrain of the area – what’s above or below. There is no average day in geotechnical engineering. In winter, I’m usually designing projects for the upcoming construction season. In summer, often it’s construction reviews to check that things are being built as designed. Spring and fall, I’m typically involved in emergency response when the snow melts, or in the fall when rainstorms hit. Rockslides, landslides or debris flows can cause highway closures. They need to be dealt with immediately to reopen roads and ensure that people and industry keep moving. I get called in to assess the situation and find a solution. The work of geotechs is very impacted by what happens with the weather. In 2011, the ministry was very, very busy across the north dealing with flooding issues and slope instabilities from heavy, sustained rains. Highways 37 and 37A near Stewart as well as highways in the Peace area had significant flood impacts – with some bridges damaged or washed away, and more than 280 sites affected. Responding to emergencies, like the extensive flood damage of 2011 and a debris flow in 2012, is part of a geotech’s work. I get involved early in projects like bridges, new passing lanes or adding additional lanes to highways. I coordinate drilling to assess the ground conditions, then design the roadway foundations based on the conditions observed. My last few years, I have been working on a lot of small bridge projects within the north. One that I’m quite excited about is fairly unique and in design right now. The foundation is proposed to be entirely sheet piles – continuous steel sheet panels that lock together like a tight wall – instead of our usual pipe pile foundation systems. Sheet piles are typically used for slope stabilization to retain lateral (horizontal) forces. However, at this site, we have underlying soft clay which poses both slope stabilization and bridge foundation issues, so we are using the sheet piles to stabilize the bridge embankments and be the foundation support for the bridge. Damage from massive rainfall in the Peace area, in 2011. What is the best base for roads or bridges? Whenever you have competent, strong ground with good drainage, that’s an ideal road foundation. Rock can be ideal but maybe not depending on its structure and the overall lay of the land. Boggy or low-lying land, and areas that have been unstable in the past, are typically the most challenging places to build roads. Boggy projects have drainage issues and usually soft soil to consider. Often we may need to preload the site with sand, gravel or rock, to provide a base that can support a road structure and traffic. We haul the materials in, put them into place and monitor how the ground settles over time, before any further road construction can take place. Roadways built on historically unstable land are tricky because you don’t want to recreate the past situation, so you may need to provide additional support systems to ensure stability. Anything else that you do? We have a significant network of slope monitoring instrumentation throughout the province where we have known instability or issues. Ministry geotechs monitor the instrumentation to ensure that the ground is either not moving or moving in an acceptable manner. Our group is also involved in assisting the district offices with rural subdivision development approval applications. For instance, if the land proposed for development is on sloping ground or near a rock cliff, we’ll assist in ensuring that proper assessments are carried out by the land owner, to identify if the land is safe for the use intended. Our group provides workshops to help development approval staff understand the work geotechs do, and identify what they should be looking for and when to call us for additional help. From the ground up, Warren Lemky and other geotechnical engineers help keep B.C.’s highways safe and reliable. Is there anything more you would like to know about these foundational members of our team? Tell us below, or connect with us on Twitter or Facebook, and we’ll try to answer your questions.